In December of 2013, Cedar Lakes Conservation Foundation (CLCF) received a generous property donation of Joan Pick’s farm and natural acreage, located along Hwy Z across from the West Bend Country Club. Additionally, her nieces gifted the two existing homes and outbuildings to CLCF. In December 2014, two native seed mixes were broadcasted onto approximately 24 acres of former agricultural fields. During the 2014-2015 school year, architecture students from the Milwaukee Institute of Art and Design (MIAD) explored the development of a nature center with a new building. Following feedback from the community, CLCF decided to eliminate a nature center building from the design and to focus on passive recreation and environmental education through interpretive signage. In 2016, CLCF engaged Clay Frazer from Eco-Resource Consulting, Inc. to perform an ecological assessment of the property. Also in 2016, CLCF engaged Lauren Brown from LV Brown Studios to develop a master plan in conjunction with the ecological assessment. 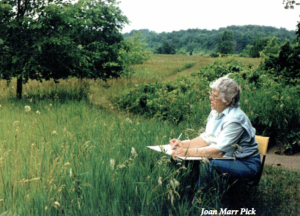 The overall guiding principle of the nature preserve master plan process was to further the mission of the Cedar Lakes Conservation Foundation in a manner that celebrates the spirit of Joan Pick. The purpose of the discussion was to hear ideas from CLCF members and Pick neighbors that would help us to formulate our plans and priorities going forward. We also gathered feedback from those present at the meeting in the form of a written survey. There were 43 community members plus eight CLCF Board members and staff for a total of 51 attendees. CLCF Board members and staff did not participate in the survey. A total of 33 surveys were returned for a 77% participation rate (33/43). 85% of respondents feel it is very important to remove woody invasive shrubs. 76% of respondents feel it is very important to remove invasive herbaceous plants. 78% of respondents are very likely or somewhat likely to use trails on the property. 66% of respondents are very likely or somewhat likely to bring children on the trails. That said, it is also clear from the responses that CLCF needs to spend more time refining a number of the components of the nature preserve in order to address community concerns. For example, areas that elicited more ambiguous responses included the need for interpretative signage (separate from entrance signage), the length of the trail system, the size and location of a parking lot, the desirability of tree and shrub plantings, and the need for seating along the trails. Given CLCF member and Pick neighbor comments, it is our intention to proceed slowly and thoughtfully with regard to this project. Our first priorities will include the management of invasive species, the establishment of an appropriately scaled trail system and the creation of memorial signage.